ola riders! Estamos começando os reviews do mais novo set especial chamado Duelist Pack: Legend Duelist 4! 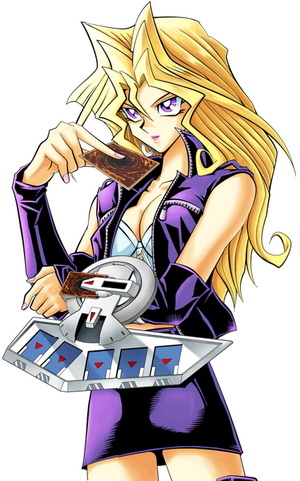 estamos analisando nessa semana os novos suportes pra deck Harpie !!! LETS GO! As harpias eram irmãs de Íris, filhas de Thaumas e Electra. Fineu, rei da Trácia, tinha o dom da profecia. Zeus, irritado que Phineas revelara muito sobre o futuro, o puniu atraves da cegueira e o colocou em uma ilha com um buffet de comida que ele nunca poderia comer. As harpias sempre chegavam e roubavam a comida de suas mãos antes que ele pudesse satisfazer sua fome, e estragavam os restos. Desta forma, elas tidas como agentes de punição, pois tinham uma natureza viciosa, cruel e violenta. Eles eram geralmente visto como a personificação da natureza destrutiva do vento. Isto continuou até a chegada de Jasão e os Argonautas. Os argonautas firmaram um acordo com Iris, que prometeu que Phineas não seria incomodado novamente pelas harpias se as mesmas não fossem assassinadas. Entao, Os Boreads, filhos de Bóreas, o Vento Norte, expulsaram as harpias, sem matar nenhuma delas. Grato pela sua ajuda, Phineas disse ao Argonautas como passar os Symplegades. With dire announcements of the coming woe. Their lamentations in the eerie trees. 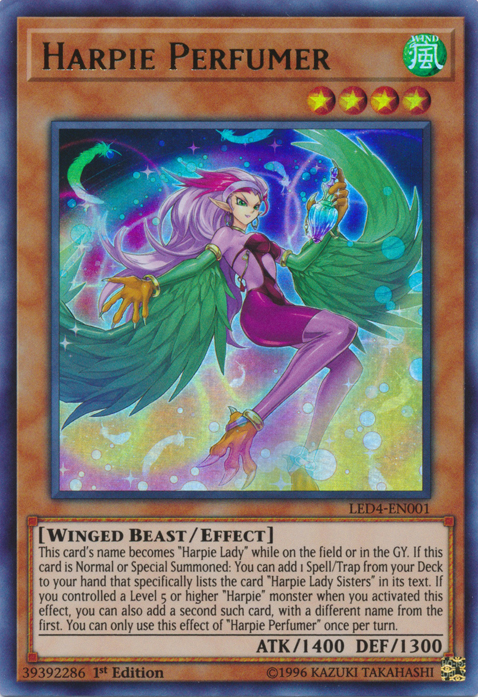 (1) This card’s name becomes “Harpie Lady” while it is on the field or in the GY. 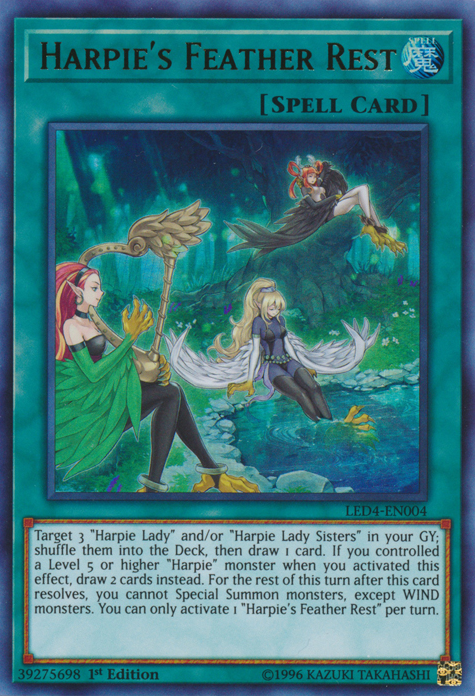 (2) If this card is Normal/Special Summoned: You can add 1 Spell/Trap Card that specifically lists the card name “Harpie Lady Sisters” from your Deck to your hand. If you activated this effect while you controlled a Level 5 or higher “Harpie” monster, you can add up to 2 of those cards with different names instead. You can only use this card name’s (2) and (3) effects once per turn each. 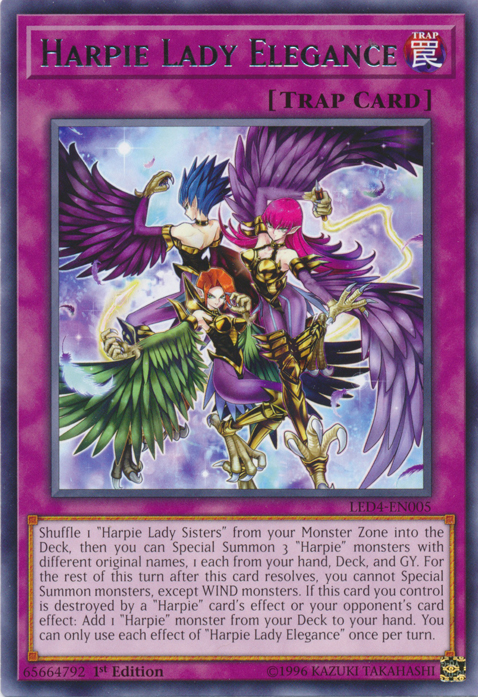 (1) This card’s name becomes “Harpie Lady” while it is on the field or in the GY. (2) If you control a Level 5 or higher “Harpie” Monster: You can Special Summon this card from your hand. (3) If this card is Normal/Special Summoned: You can activate this effect; during the End Phase of this turn, add 1 Spell/Trap Card that specifically lists the card name “Harpie Lady Sisters” from your GY to your hand. You can only use this card name’s (1) and (2) effects once per turn each. 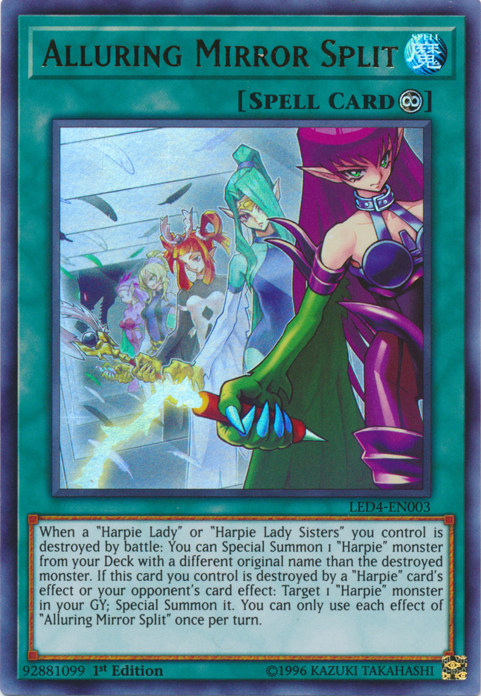 (1) When a “Harpie Lady” or “Harpie Lady Sisters” you control is destroyed by battle: You can Special Summon 1 “Harpie” monster with a different original name from your Deck. (2) If this card on the field is destroyed by an opponent’s card effect, or your “Harpie” card effect: Target 1 “Harpie” monster in your GY; Special Sumon it. (1) Target 3 “Harpie Lady” and/or “Harpie Lady Sisters” in your GY; return them to your Deck, then draw 1 card OR if you controlled a Level 5 or higher “Harpie” monster when you activated this, draw 2 cards. After this card is activated, you cannot Special Summon monsters, except WIND monsters for the rest of this turn. You can only use this card name’s (1) and (2) effects once per turn each. 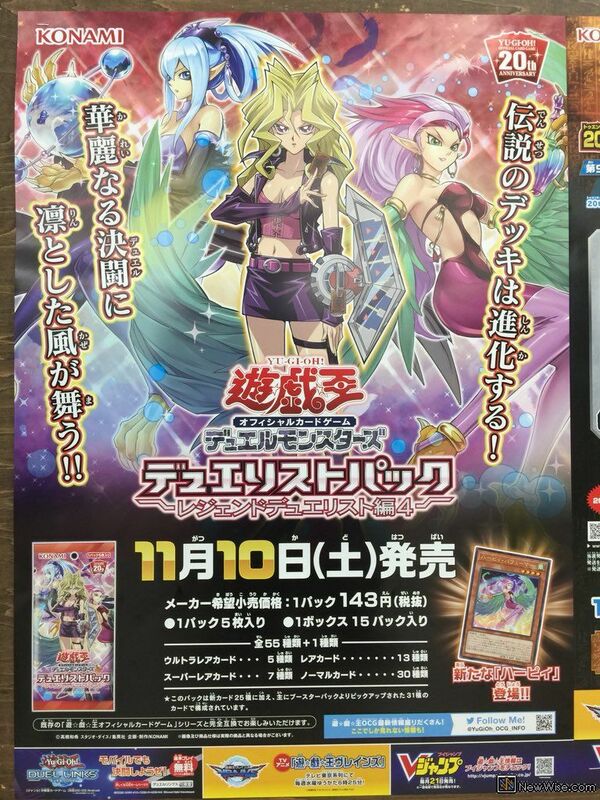 (1) Return 1 “Harpie Lady Sisters” you control to the Deck, then you can Special Summon 3 “Harpie” monsters with different names (1 each from your hand, Deck, and GY). You cannot Special Summon monsters for the rest of this turn, except WIND monsters. (2) If this card on the field is destroyed by your opponent’s card effect or your “Harpie” card effect: Add 1 “Harpie” monster from your Deck to your hand. voltamos em breve com mais reviews pra vcs! 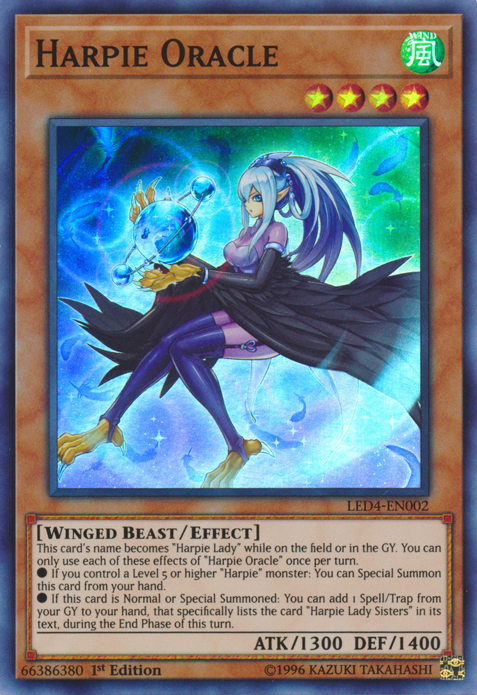 Harpie Perfumer (YgoPro) - NEW Harpies for TOP TIER! !